Honda Racing/HPD has been a supporter of the Superkarts! USA Pro Tour program since it began in 2010. Their award program for the 2017 season provides $2,250 for each of the four Stock Honda divisions. The champion in each category will receive $1,000, with second earning $750 and third a check for $500. New for the 2017 season was a new prize package provided by IAME USA. 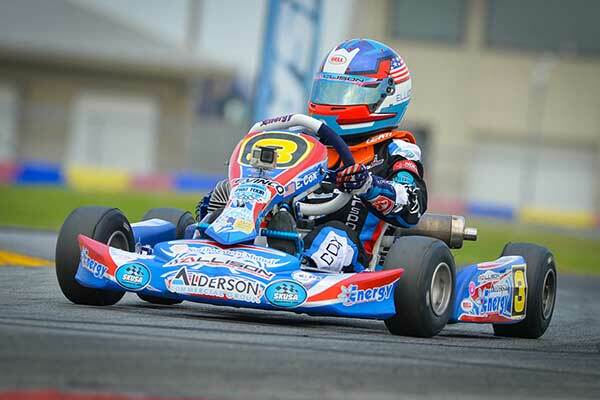 The X30 Senior, X30 Junior, X30 Master and Mini Swift drivers competed to win the chance to represent Superkarts! USA at this year’s IAME International Final in Le Mans, France on October 9-15. 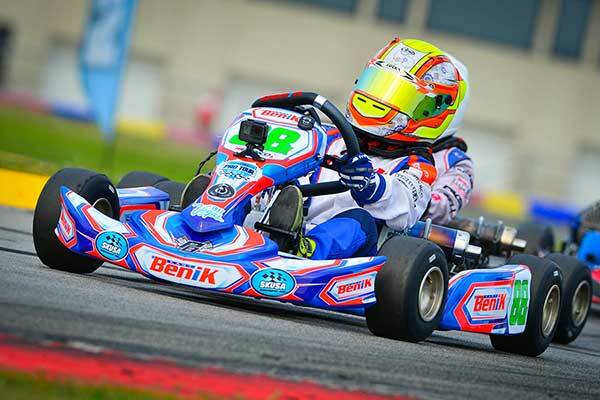 The prize package for each of these champions includes full event entry, tented pit spot, an arrive-and-drive kart/engine set-up with a dedicated mechanic, and a custom Team SKUSA/IAME USA suit from Freem. Although the experience and chance to race against the best IAME drivers in the world is priceless, each of these prize packages alone is worth about $10,000. The main prize every driver fights for at the SKUSA Pro Tour is to win the title in their respective division. With that, Superkarts! USA then invites all drivers to earn a title into the SKUSA Circle of Champions program. SKUSA promotes their champions by inviting each driver with a special sponsorship program for the following season. The 2017 Pro Tour champions, along with running the SKUSA #1 plate, are provided with complimentary entries, race tires, fuel and oil for the 2018 Pro Tour season, including the SKUSA SuperNationals. The SKUSA Circle of Champions for 2018 is worth over $4,000 to each champion. The championship chase in the X30 Senior division was among the tightest races in the eight-year history of the SKUSA Pro Tour. The top three drivers finished the year separated by just 24 points. When the final checkered flag waved, 2016 champion Ryan Norberg was able to defend his championship, becoming the first back-to-back title winner in series history for the category. Norberg finished top-five in four of the six races, including a victory at the SpringNationals and runner-up at the SummerNationals that helped keep him on top of the championship standings. Four points was the difference between he and 2014 title winner Jake Craig. The inaugural WinterNationals winner finished the year with five top-five results – three on the podium – to earn the SKUSA #2 plate for 2018. Ending third for 2017 was last year’s vice-champion Brandon Jarsocrak. A sweep of the final round at the SummerNationals was not enough to put him in the #1 position, combined with three third-place finishes on the season. The 2017 season was a true championship performance put in by Jake French. The Stock Honda ladder system product shined throughout the year, recording six straight podium finishes on the season in the headline S1 Pro division. The inaugural victory at the WinterNationals put him on top of the standings right away, never relinquishing the position. Two runner-up and a third place performance was followed by a sweep of the SummerNationals, stamping his name on the ‘Janowski’ trophy awarded to the S1 Pro Tour champion. Billy Musgrave had his best season at the SKUSA Pro Tour, matching his personal best finish in the standings with a vice-champion position. Musgrave scored victory for the third straight season, adding two runner-up results. Top rookie for the 2017 season was Mathias Ramirez. The 2016 S2 SuperNationals winner showed speed all season long, placing inside the top-four in four main events. His first podium came in the final round at the SummerNationals, helping to put him third in the championship. It was a near flawless season for Riley Dickinson in the S2 Semi-Pro Stock Honda category, with the 15-year-old claiming his first SKUSA Pro Tour championship. Dickinson finished all six main events inside the top-four, opening up the season by winning the inaugural race at the WinterNationals. A win at the SpringNationals and the SummerNationals in addition to two other podium finishes helped the Texan clinch the championship. The gap back to second was not much (20 points) with championship rival Kyle Wick coming on strong late. Wick ran first or second in the final four rounds, including a win in Sonoma and New Castle. The Washington driver finished with a total of five podium finishes on the year. Sky Finley put two Texas drivers on the championship podium for 2017. Finley ended with three top-five finishes to earn the SKUSA #3 plate for 2018. Derek Wang was one of three drivers to defend their respective championship. The X30 Master title chase went down to the wire, with last year’s champion Wang securing the 2017 championship on the final day thanks to three straight podium finishes to end the season. 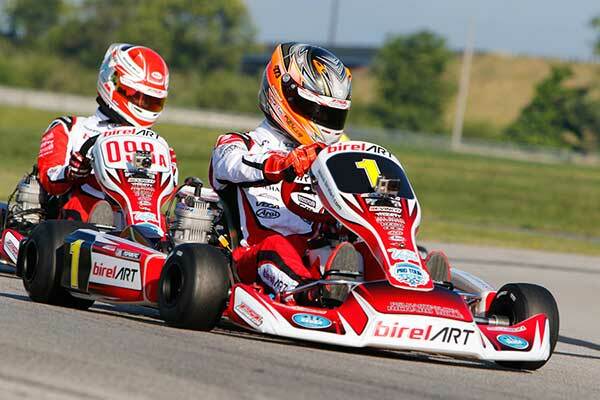 Laurentiu Mardan swept the on-track action at the SummerNationals to earn his first career SKUSA Pro Tour victories, beating out Wang in the win column. The victories helped to put Mardan just ahead of Travis Irving for the SKUSA #2 plate in 2018. Irving ran runner-up to Jess Peterson at the SpringNationals after two top-five finishes at the WinterNationals. Prefinal issues cost him points both days at New Castle, and with the two fourth place results, came 11 points short of Mardan’s total. Jordon Musser became the second driver to earn a second championship in the S4 Master Stock Honda division. The first was Jimmy McNeil (2011, 2015). Musser earned his first Pro Tour championship in 2013, placing second, fifth and second in the following seasons. The season began with Musser on top of the podium, followed by three straight runner-up finishes. Victory Saturday at the SummerNationals solidified his championship bid, putting his name on the new ‘Murley’ trophy for the first time. His season was capped off with a fourth runner-up finish to close out the season placing first or second in all six main events. Last year’s champion Ryan Kinnear scored two victories of his own in 2017, one in Sonoma and the other at New Castle. A total of five podium finishes was not enough to match the score set by Musser for the title. Finishing third is S4 newcomer Ben Schermerhorn, as the Colorado driver ended the season with three straight third-place performances. The S4 Super Master Stock Honda division belonged to Robert Marks for the first two seasons of its inclusion on the SKUSA Pro Tour. Marks scored the inaugural championship and SuperNationals victory in 2016. He returned with four victories in 2017 to help him defend the championship. A close second all season was veteran Mike Jones. The Texan was runner-up three times in the six main events, falling short in the overall title chase to Marks. The battle for third went down to the wire, with Rod Clinard holding his #3 SKUSA plate for another season. 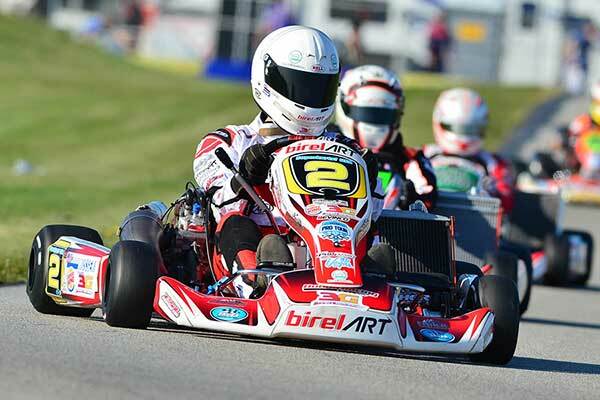 Clinard scored his first SKUSA Pro Tour victory at the SpringNationals, adding two top-five performance at the SummerNationals to clinch a spot on the championship podium. 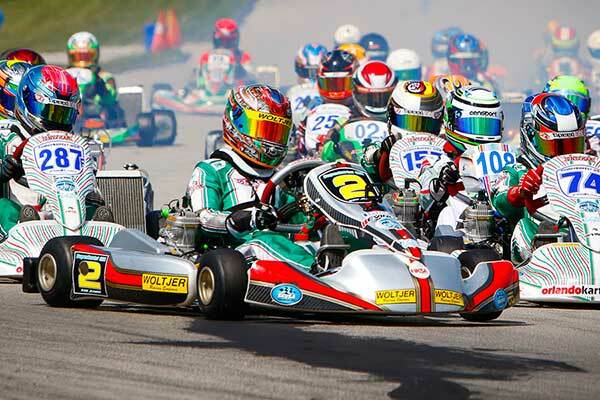 The X30 Junior division is among the tightest and most competitive categories on the Superkarts! USA Pro Tour. Dylan Tavella took the title chase out of the equation early, clinching the championship a day early at the SummerNationals. With his third victory on the season, it was no surprise to see the New York driver gain enough points over the first five rounds to secure the title. The 15-year-old scored his first SKUSA Pro Tour championship, and will now look to earn his first SuperNationals victory this November. Junior rookie Jak Crawford finished the season in the second spot in the standings, recording four podium finishes. 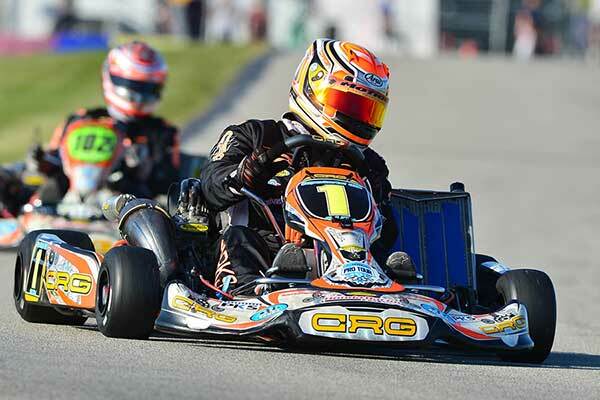 14-year-old Trey Brown was a close third in the chase thanks to his two victories on the season, as the former Streets of Lancaster Grand Prix scholarship winner will carry the SKUSA #3 plate in 2018. For a sixth straight year, the SKUSA Pro Tour has crowned the sixth different Cadet champion following the back-to-back performances by current IndyLights driver Colton Herta in 2010 and 2011. Fellow Californian Carson Morgan has added his name to the record books, securing the championship in the Mini Swift division. Morgan’s double win weekend at the SpringNationals helped put him in the driver’s seat for the championship. Two more podium finishes in New Castle secured the championship for Morgan, finishing the year with six top-five finishes. Reece Gold has been among the top Cadet drivers over the past two years, including two wins at the 2016 SummerNationals. Gold went winless in 2017 but recorded five podium finishes to put him second in the championship chase. Last year’s SKUSA #2 Diego LaRoque battled issues all season long, ending strong with a double win weekend at New Castle to close out the season, helping to put him third in the final tally for the title chase. Elliot Cox is the second champion in the Micro Swift division. Cox finished third in last year’s chase to Kai Sorensen and Brandon Carr. The driver from Indiana will celebrate in Las Vegas this year as the class champion, thanks to his one win and two runner-up finishes that helped to clinch the championship. 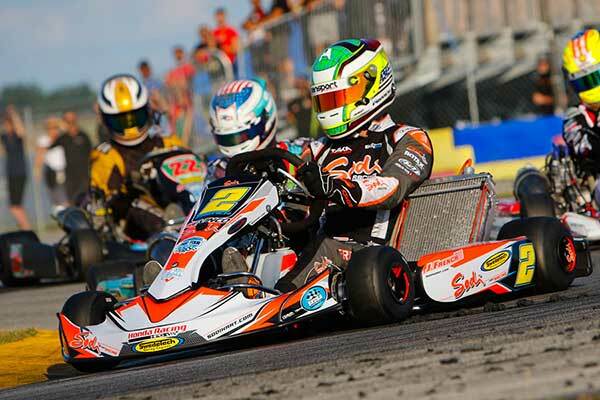 Finishing the year in second is Frankie Iadevaia, completing his first full season on the SKUSA Pro Tour. The New York driver finished inside the top-five four times in the six main events, helping to edge out Carr for the position. Last year’s #2 from Great Britain finishes 2017 in the third spot, recording one win and two third-place finishes to his credit. The top-three finishers in the Superkarts! 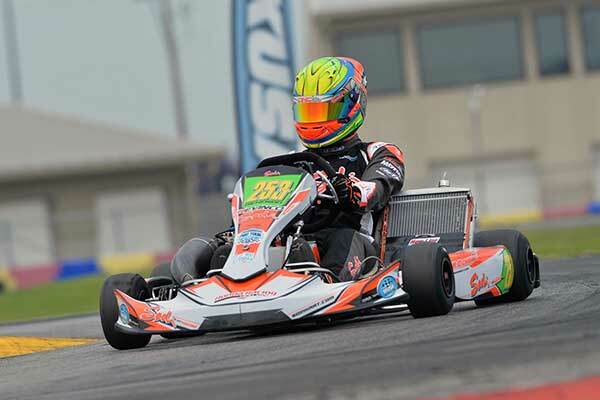 USA Pro Tour standings for all nine categories will continue to earn the special guaranteed starting spot in the main event at the SKUSA SuperNationals. In year’s past, this rule was in place to help championship contenders remain in the chase with the SuperNationals counting as a Pro Tour event. Now that the SuperNationals has returned to a stand-alone event under the SKUSA banner, the top-three finishers are provided with this added bonus – a SKUSA SuperNationals SuperSunday main event spot – in their respective categories this November. The SummerNationals at the New Castle Motorsports Park was the largest event of the SKUSA Pro Tour outside the SuperNationals, welcoming 261 entries in the nine categories competing. 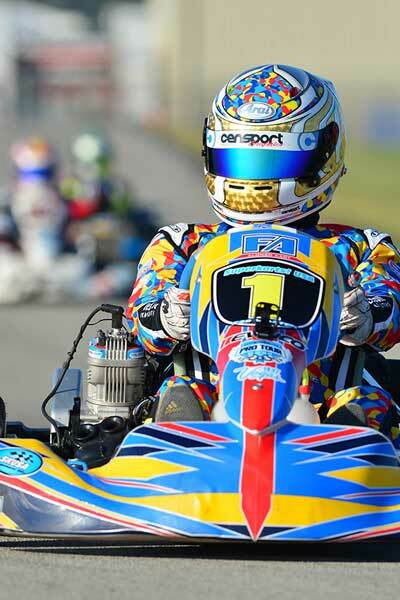 The trend of increased entry numbers from the WinterNationals in NOLA Motorsports Park to Sonoma for the SpringNationals shows the SKUSA Pro Tour is the elite championship in North American karting. Superkarts! USA would like to recognize those drivers that won prize money from the SKUSA SummerNationals in August. A total of $7,000 was scored by drivers in the headline S1 and X30 Senior divisions, along with prize money in the X30 Junior and Mini Swift divisions. Jake French won the overall points total on the weekend to take home the $1,000 payday in S1. Veteran Gary Carlton was second ($600), with rookies Mathias Ramirez ($400) and Kyle Kalish ($300) ending up third and fourth. Billy Musgrave ($200) completed the weekend podium. X30 Senior race winner Braden Eves collected the most points on the weekend to earn the $1,000 check. Former champion Jake Craig was second ($600) with rookie Alex Bertagnoli third ($400). Two-time champ Ryan Norberg ($300) finished the weekend fourth in the point total while Canadian Kellen Ritter was fifth ($200). Round Six victor Trey Brown scored the most weekend points in the X30 Junior division to earn a $500 check. Tyler Gonzalez was second in the order for $300 with Round Five winner Dylan Tavella in third for $200. The top three finishers in the Mini Swift championship chase finished top three in the weekend total from the SummerNats to split up the $1,000 class purse. Diego LaRoque won both days, helping him take home $500, while Reece Gold and Carson Morgan were second ($300) and third ($200). Superkarts! USA will honor the 2017 Pro Tour champions and podium finishers with an Awards Presentation during the 2017 SKUSA SuperNationals in Las Vegas. The event is scheduled for the evening of Wednesday, November 15 inside the host hotel for the event – the Westgate Las Vegas Resort & Casino. More details regarding the event will be released in the coming weeks. Entry to the SuperNationals 21 remains open at the MotorsportsReg.com SKUSA link until October 30.